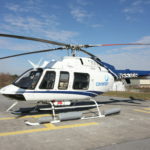 Here's Why Jet Owners Need a Helicopter - Africair, Inc.
Helicopters are extremely versatile aircraft that complete extraordinary operations each day. From assisting with executive travel to rescuing people stranded in oceans and mountains, there are many missions that require the use of vertical lift aircraft. Security and Privacy: Helicopters enable passengers to work and converse in private, eliminating chances for eavesdropping and decreasing passenger visibility. This method of travel is ideal for protecting confidentiality. Accessibility to Limited Areas: Jets require runways, which are not always available. Helicopters reach certain locations that are not accessible with fixed-wing aircraft. Having a helicopter will ensure that no location is unreachable. Not to mention that helicopters can land in backyards, near stadiums or on rooftops taking you directly to your destination as opposed to solely an airport. Saves Time and Achieves Goals: Take a lesson from professional NASCAR driver Kurt Busch who used Bell helicopters to race in both the Indianapolis 500 and the Coca-Cola 600 in the same day. He used a Bell 407 to fly from the Indianapolis Motor Speedway to his jet, which took him to Concord, North Carolina where he flew in a Bell 429 from the airport to the Lowe’s Motor Speedway. By successfully racing in both races and becoming the fourth NASCAR driver in history to achieve this feat, he proved that important goals can be reached when using a helicopter during a limited time frame. Not everyone will become the one of the few drivers to compete in two races, but helicopter owners will save time they need to reach significant milestones and make great things happen, either in business or in life. Saving Money – Always a Bonus: If you travel frequently, either for business or personal travel, the productivity and cost savings of utilizing a helicopter will benefit you. Figuring how much time you and your colleagues spend on commercial airlines, purchasing a helicopter will save you money in the long run, not to mention the convenience of reaching your destination in about a third of the time. View the chart below to see how much your business can save with a helicopter purchase. *Figures are calculated under the assumption that a CEO’s salary would be $3,000,000, a C-Suite Executive’s salary would be $400,000 and a Mid-Level Manager’s salary would be $150,000. Also, it is assumed that one CEO, one C-Suite Executive and one Mid-Level Manager are riding in the aircraft. If colleagues are flying from Santa Barbara to Los Angeles, traveling in a Bell helicopter could save them over $38,000 in time saved. Also, the passengers can continue to work or even host a meeting during flight increasing productivity compared to commercial travel, resulting in 61.6 productivity hours. Bell Helicopter delivers top of the line products to our customers and ensures that every ride is efficient, comfortable and safe. Our products are designed to complement all business and personal needs and offer convenience and comfort to every passenger. Bell 505 Jet Ranger X: Soon appear in nearly every corner of the world, this is the aircraft needed for a budget friendly, yet fast helicopter travel. The Bell 505 fits four passengers comfortably and can be configured to accommodate VIP passengers, owners and operators. Need a quick ride to the airport to meet your jet? This is the helicopter for you. Bell 407 GXP: The Bell 407 GXP has a corporate interior and is exceptionally quiet during flight. Six passengers can comfortably fit inside the aircraft and experience the smoothest ride in its class. Bell 429: Always a photo-favorite, this visually stunning helicopter includes a spacious cabin that fits up to seven passengers and combines sleek exterior lines and meticulously crafted interiors for a comfortable in-flight experience. Bell 525 Relentless: When traveling with your business team, family or with a group of friends, the Bell 525 accommodates large groups with comfortable, luxurious spacing and low noise. Seating up to 20 passengers, depending on your needs, the Bell 525 can also be outfitted with the most luxurious cabin interior on the market today, the Mecaer VVIP interior, deluxe seating that sets the Bell 525 apart from any other VIP aircraft.